How did you become interested in the topic of narcissism? Did the current cultural and/or political climate play a role? As a psychologist, I have always been interested in personality, and particularly the way in which culture and personality interact. During the 2016 presidential election, I was curious about the ways in which the very personality characteristics people were finding repellant were at the same time being reinforced. What stood out to me was what I call the fragile-bully dynamic, one that was familiar to me from childhood and a central characteristic of unhealthy narcissism. What narcissistic traits or tendencies have you seen President Donald Trump exhibit? 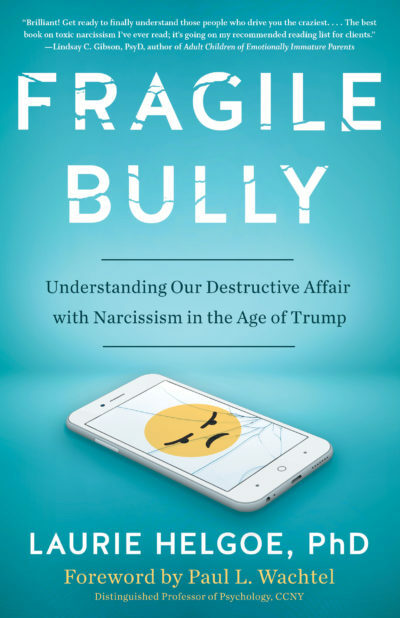 What I’m noticing in the interactions between President Trump and the public—and particularly, the media—is the fragile bully dynamic I talk about. I have never met or evaluated the president, so I only see what is available to the public. What becomes very visible is the mix of grandiose provocations (bullying) and retaliatory defensiveness (fragility) evident in Trump’s tweets and rallying points. The reason I resist diagnosing the president is not only because I lack the data and permission to do so, but also because this temptation is part of the problem. We are far too focused on the personality of Donald Trump, and in our reactions to that personality, we begin to evidence the very behaviors we ascribe to him. This is the meat of my book—that destructive narcissism is bigger than any of its subscribers, and that we need to understand the ways our “solutions” end up contributing to the problem. Is there a correlation between narcissism and leadership? Yes and no. What the literature typically finds is a “double edge” of positive and negative features. Narcissistic leaders may appeal initially because of their charisma and bold visions. However, they do poorly when it comes to team support and employee satisfaction. A retrospective analysis of U.S. presidents up to and including George W. Bush revealed an increasing trend toward narcissism among U.S. presidents. High levels of grandiose narcissism were correlated with both “greatness” and unethical behaviors. What role does the media play in reinforcing narcissism? Media is a narcissist’s best friend, though the parties involved may not appreciate their bond. Especially in the age of diminishing attention spans and limitless competition, media cannot survive without followers. A narcissist can’t survive without followers. Narcissists help the media by providing spectacle, by inciting reactions, and by creating drama. The media helps narcissists by keeping the focus on that spectacle—even if the focus is negative. In your book you say, “in the world of celebrity, no publicity is bad publicity, and, sadly, the best publicity often comes with fragile bully drama.” Can you give us some examples? Take any designated villain on The Bachelor. She hogs the spotlight, comes off as arrogant and self-absorbed, and she’s mean. Viewers want to see The Bully taken down, so they stay glued to the drama. But opponents go too far, or else The Bully can’t take what she dishes out. She breaks down and becomes Fragile. “Everyone is so mean,” she may cry. The witness to this breakdown may feel a tug, or just get angrier, but this is good drama, and it fuels the franchise, season after season. How do you know if you’re dealing with a narcissist? What are the characteristics/signs? With some mental health disorders, such as major depression and generalized anxiety disorder, the one with the disorder is the one who suffers. With severe personality disorders such as borderline and narcissistic personality disorders, it is often the people in the lives of the affected person who suffer. So we can often sense we are dealing with a narcissist by the feelings he or she arouses in us. Narcissistic characteristics such as grandiosity and a sense of entitlement tend to elicit aggressive feelings—a desire to put the narcissist in his or her place. The narcissist’s lack of empathy may elicit extreme frustration. And on the flip side, the narcissist’s focus on his or her fragility can leave others feeling trapped—trying to “fix” the narcissist so that he or she can be more available. People are also drawn in by the narcissist’s charisma or fragility, gaining a sense of importance by being in the shared spotlight or by the promise of being the fragile narcissist’s savior. What advice do you have for someone with a narcissistic co-worker? Watch for the hooks. A fragile bully reflexively shifts away from responsibility by provoking, then acting hurt in response to retaliation. So even though the fragile bully started the fight, he or she may end up reporting you to a supervisor. Don’t take the bait. Try to view narcissism as something acting on both of you, and work to stay under its radar. Sometimes an honest disclosure of what you need from that coworker will empower him or her to respond, and sometimes you’ll just learn that it’s not safe to bring any needs to that relationship. Document problematic behavior instead of retaliating. And watch the tendency to focus your best mental resources on the least rewarding relationships. You will not outwit the narcissist, and even if you do, the reward will leave a bad aftertaste. In what ways do narcissists damage those who love them? At worst, a narcissist can manipulate a loved one into participating in his or her own destruction. The fragile-bully dynamic leaves loved ones with nowhere to turn: defend yourself, and the partner feels victimized; distance yourself, and the partner feels abandoned; express an independent thought, and the narcissist feels threatened. The unwritten contract is to empty yourself and keep dancing in step with the narcissist’s needs, even when those needs hurt you. What steps should someone in a relationship with a narcissist take to break free and recover? Breaking free from a destructive relationship requires a great deal of compassion for oneself. It is easy for those in relationships with narcissists to turn on themselves, asking how they got into this mess in the first place or even wondering if they deserve better. Developing empathy for oneself is crucial to the process of healing and emancipation. It’s also important to make room for the grief of ending a relationship—even a destructive one. The grief may have more to do with disappointment that you were unable to “fix” the narcissist or that you invested so much in a relationship that turned on you. Practicing self-care, finding trustworthy support, and planning for how to deal with the inevitable push-back will help ensure a successful separation. There will be plenty of pulls to re-engage, so engaging instead in other meaningful pursuits will help quell the temptation. Is there anything that can be done to help a narcissist gain self-awareness and become a better person? This is tricky territory. It’s tricky because so much of what we do reflexively to help the situation often feeds the vicious circle. For example, trying to “help” the narcissist may allow him or her to continue to neglect your needs. Extreme narcissists are very crafty at keeping the focus on themselves, and are likely to be unresponsive to invitations to change. There is evidence, however, that moderate narcissism can be modified in strong relationships where there is sufficient investment. Narcissism sets up a “you versus me” dynamic, so breaking that dynamic is key. “You are important to me” statements combined with what Craig Malkin calls “empathy prompts”—“I feel/need/want,” help empower the self-absorbed to be cognizant and supportive of the loved one. If such efforts—which may be better accomplished with the help of a therapist—do not work, this may be a sign that the capacity for empathy is just not there.